Caitlin Weigel draws connections between culturally exquisite locals and Philly’s own wonders. LONDON – The pull of world travel seems to capture almost everyone at some point or another. Whether it strikes while flipping through National Geographic at the dentist’s office or as you happen to channel-surf past the latest Olsen twin, conquest-of-a-global-city movie on ABC Family – the travel bug bites hard. The lure of exploring a foreign place, where the knowns of your own world are thrown aside in favor of a whole new way of life draws us in like moths to a light. We long to experience the culture of a place halfway across the world, to walk a mile in another person’s shoes, to escape from a world of McDonald’s and Ke$ha in favor of a rich tapestry of history and tradition somewhere else – these are the wanderlust dreams that seem to seep into our mind as we zone out on our SEPTA commute. And while sailing on this magic carpet of traveling idealism is pretty sweet, you eventually run into that small snag – the Jafar in your otherwise perfect Arabian night. As a college student, most of us simply don’t have the money to front around an “Around the World in 80 Days”-style vacation. Then there’s the time factor. Between clubs, teams, jobs, friends and – oh yeah – class, it’s a little difficult to find the time to book a flight. It’s not like you can just hop over to Paris for a weekend getaway and grab a speedy lunch in Rome. 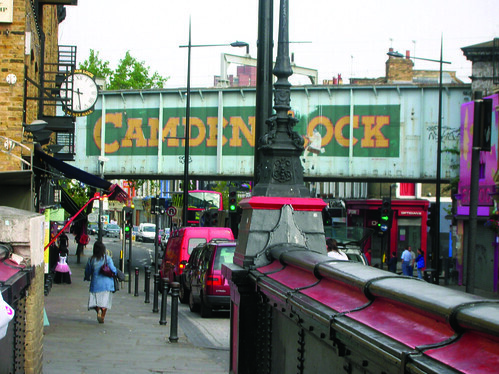 CAITLIN WEIGEL TTN Camden Lock is considered the epicenter of many London subcultures and is home to numerous alternative markets. Philadelphia is home to similar communities, such as the Italian Market area and Chinatown. This, my friends, is where I come in, donned in my Robin Williams genie costume carrying a bottle of Calamine lotion. This semester I’ll be living across the pond in London, reporting back to you on the various cultural happenings I stumble upon in my travels. But more than just telling you what I’m doing – where’s the fun in that? – I’ll be telling you how you can do the same thing, no plane ticket necessary. Because underneath our cheesesteak-eating, “Adrian”-yelling, Phillies-freak-out exterior, Philadelphia has got it going on in the cultural sense. Between Chinatown, the Italian Market, the Korean population of South Philadelphia, the Ethiopian hub of West Philadelphia and the countless other ethnicities represented in pockets around the city, the city might as well be Epcot. Philadelphia has more delicious foreign foodstuffs, global music and art and cultural festivals than you can shake a passport at. So skip the airport security check-in and jetlag. Instead, don your tourist socks and sandals combo, and get ready to expand your horizons. This semester, we’re taking Philly global. The 9th Street Stock Exchange encourages local businesses to showcase each other’s items.